Ian Schon made a name for himself by making a simple, well-designed pen in his Brookline, MA shop that's also durable and beautiful. He did all the design iterations himself on an old lathe from 1907 that's in his shop, carefully tweaking and testing various versions. Then the entrepreneur took to Kickstarter to grow his business, Schon DSGN, outsourced manufacturing to US-machine shops, and now his pens, which come in aluminum or titanium are available in a number of places including his online shop, Huckbery and Ball & Buck. I met Schon at the American Field event a few months back in Brooklyn and was genuinely struck by his infectious excitement for product design. We got to talking and he invited me to his Brookline shop to see the latest product he’s working on, a watch. 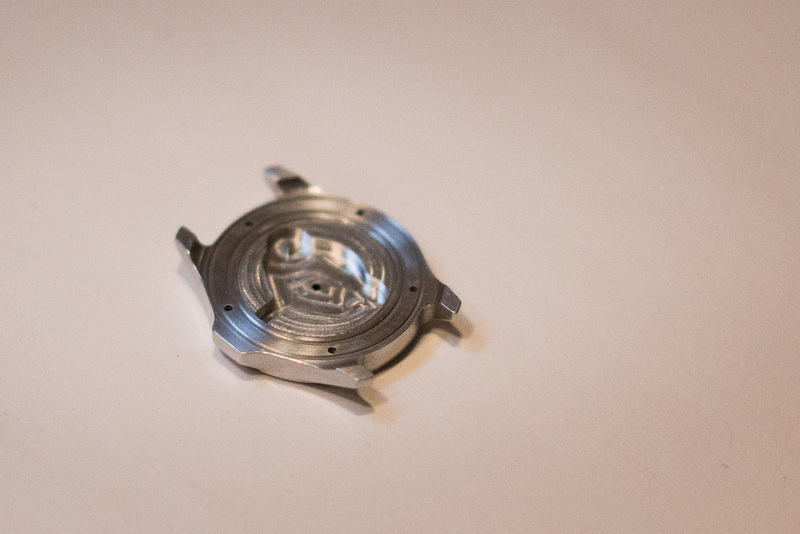 I got to a see a little of what it takes to machine a watch case...not an easy thing. You can see more of that process unfold on his Instagram feed @the_schon. As well as being a maker of highly-designed writing instruments, Schon is also a competitive cycle-cross rider and design engineer at Ideo by day. To say he’s a busy guy would be a massive understatement. The following is a Q&A we did over email after I visited him. Tell us about yourself and your journey into design/machining? I have been building things for as long as I can remember. Whatever my hobby was, from skateboarding to snowboarding to bike racing I was always trying to innovate and design with the things I was into. That led to lots of projects and time in my basement cobbling together new ideas and designs. When the time came to chose a career I was drawn to engineering due to my love of making things and stated my Engineer degree but quickly found it lacking the skills needed for physical product design and manufacturing. So I took it upon myself to learn machining to supplement my degree and get the skills I needed to make my designs come to life. I was quickly brazing bicycle frames, doing engineering and design work for small businesses and machining whatever crazy ideas I had with the time in between. Post college I joined the consulting world and have been designing medical devices, scientific instruments, pro audio equipment, home automation and whatever comes my way through my day job. The project started in 2011 when I wanted to stop designing for my hobbies and niche community and make something that everyone could relate to. The design challenge I posed to myself was to design an everyday object and I settled on making a pen that was unique and could last a lifetime. Can you tell us a little bit about your process as a designer? Where do the ideas come from? Most of my ideas come from problems I see in my life or out in the world, as well as "hacks" that have been done to fix these problems. For instance, seeing someone cobble together a makeshift solution using duct tape or some common materials can be the hint that something about that product or process is inefficient and is ripe for disruption and redesign. I can then spend time thinking about the people behind the problem and how I can design to best suit their needs. How important is it to have the materials in your hands while you design something? Critical. I am a strong believer in building to think. Sometimes projects require hundreds of hours of design time. Is is important to stand up, grab some material and make something. You never know what you will learn or come up with. When I started making pens, the first pens I made were designed on scrap paper and the aesthetics were eyeballed as I turned them on the lathe. Future prototypes were more refined, but the learning from the initial parts and time with the machine and material were priceless. Tell us about the main tools you use in your shop, especially that lathe. The two tools I use most are a small benchtop CNC milling machine and a Hardinge lathe from 1907. The lathe is special since it is similar to the lathes used in the Waltham watch factory in Waltham, MA. I recently bought another Hardinge screw-making turret lathe that I have been experimenting with as I tool up for the watches I plan to make next year. What is it about product design that you love? You mentioned that for a while you just really really wanted someone to use a product you made? I don’t know what it is, but I am obsessed with objects that are easy and pleasant to use. Object culture is a big part of our daily lives and I want to tap into ways to make everyone's lives more meaningful or more enjoyable though the design of things. When I got the reaction I did with the pen I was addicted to the idea that people loved what I made for them and that they used the pen daily. It’s like cooking a tasty meal and having someone tell you it’s delicious. It means a whole lot to me. It’s kinda everything. Can you tell us about your principles and values as a designer, that your designs reflect? Simplicity, timelessness and ethics. Simplicity in the way that I strive for the least design possible to make the most impact. Keep it simple. Timelessness. Products should stay relevant with the times without requiring modifications. Timeless design and heirloom design are characteristics that I strive for. Make things your grandkids will fight over when you are dead. Finally, Ethics. Ethics are huge. You need to know where you products are being made and the impact that the process is making. I visit my machine shops and do as much research as possible when I contract out to make sure the shop is following proper environment procedures and treats their workers the right way. You are responsible for the things you make and the consumers are responsible for what they buy. For this reason I make all my products for Schon DSGN in America. All my machining is done in America, materials and packaging are manufactured, sourced and assembled here. Doesburg has been my art muse lately. Vintage tools and machinery. Seeing other people make stuff they give a damn about. Watches. I am excited by the trends I see rising in american watch making and want to do something different. I recently did some contract design and engineering on a watch and got super excited by the process so I am currently working on some watches of my own. The idea is to have the cases made by my hands and the tools in my shop. I want to celebrate this process and create some incredible timepieces. When I see something I want to make I make it. I buy books, dive deep, get tooling and find materials. Once I become obsessed I pretty much don’t stop till I’m done. I think it’s a blessing and a curse. I usually make one or a couple of what I am obsessed with and then decide if I want to scale or keep making things myself. Lately the watches have been all I am working on. What would your advice be to anyone who is thinking of getting into design? Get your hands dirty as often as you can. Get off the computer and make some things. You will learn to be a better designer or engineer and will be left with some awesome portfolio content.